Published: . Filed Under: Parenting, Raising Kids, Uncategorized. Summer is in full swing around here. We’ve had our first official heat wave. The corn on the cob is fresh and perfect. My son has decided that his first summer loves are sprinklers and sandboxes. 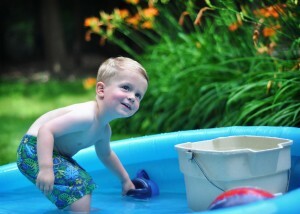 And his beloved kiddie pool. My son in the sun! What does your family need to have on hand before heading out for summer fun in the pool, at the lake, in the garden, or at the campsite? Check out the following informative (and pretty!) infographics created by OTCSafety.org to make sure that you’re prepared for whatever summer throws your way! If my son had his way, he’d spend the whole day in the sun. My biggest summer-related challenge is to make sure that he lets me put on enough sunscreen and reapply it every time he gets wet or we’re out for more than a couple of hours. Most days he surrenders to the sunscreen lathering; other days he screams his favorite word, “No!” enough times to make me rethink our outdoor plans. Another one of my son’s favorite toddler summer past times is charging around the sidewalks of our neighborhood. We’ve had our fair share of knee scrapes and falls this summer. I’ve learned pretty fast that I should have my diaper bag stocked with first aid supplies, such as bandages and ointments! Bugs aren’t too much of a problem for us since we live in the city. I grew up on a farm in the mountains where mosquitoes, black flies, ear wigs, and wasp nests were constant companions. Recently we spent a weekend in the country, and my son got his first bug bites! 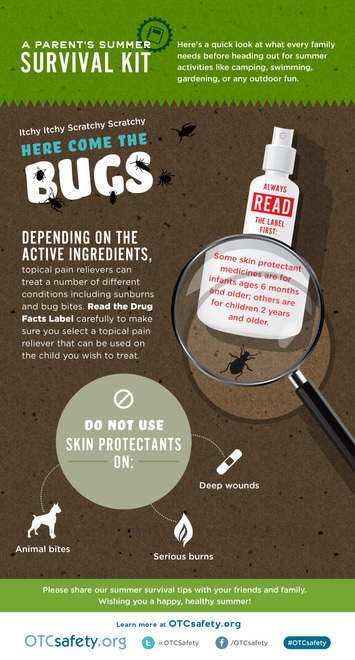 One tip: Read the insect repellant label carefully to make sure that it’s meant for your child’s age, since some are made for babies six months and under and others are for older children. What are the most challenging parts of summer safety for your family? Be sure to follow @OTCSafety on Twitter and on Facebook to learn more about summer survival tips. And share these tips with your friends and family using your own social networks, using #OTCSafety! 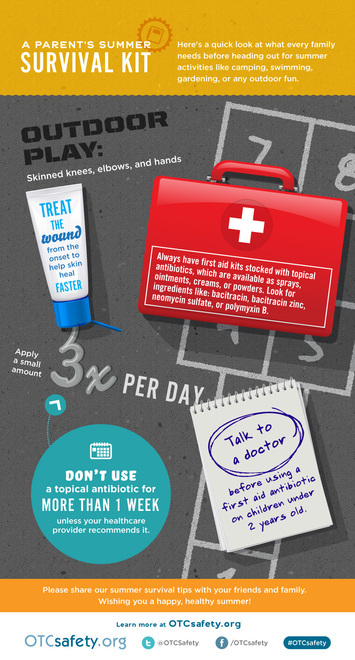 All great tips and fantastic infographics. Thanks! will have here on this post. I shall be coming again to your weblog for more soon. Ethylphenidate according to the standards accepted by your local chemical licensing committees. A moist filter paper is positioned inside the Sintered Glass Buchner Funnel. Choosing the right type of expedient will help you in attain the results you want.